Ed Miliband will today take the audacious step of denouncing the hubristic boast of his patron, Gordon Brown, that Labour could abolish economic boom and bust, saying the assertion simply fuelled the anger of voters confronted by economic insecurity and joblessness. The attempt by Miliband, in his first leader's speech to Labour conference, to swiftly distance himself from one of the central planks of his long-time boss is designed to show his leadership signals the arrival in power of "a new generation with different attitudes, different ideas and different ways of doing politics". But his efforts to show he can lead a united, re-energised party committed to redefining the centre ground of politics look likely to be hampered by the expected decision of his defeated brother, David, to leave frontline politics to give him the chance to lead on his own terms. Ed Miliband is said to be still trying to persuade him to remain at the top of Labour politics, and insisted there was "no psychodrama" between them. It will be interesting to hear what he actually does say about Boom/Bust later. Brown was the motor of boom and bust. His work is done. "Ed Miliband To Say Labour Was Wrong Over Boom And Bust"
HPCers to Say - "No S**t Sherlock". Ed Miliband will today list Labour's mistakes during its 13 years in power and promise not to repeat the arrogance and hubris of Gordon Brown's boast that he had abolished "boom and bust". In his first keynote speech to the Labour conference as the party's leader, he will distance himself from Mr Brown, for whom he worked as an adviser for 10 years before becoming an MP, in an attempt to draw a line under the Blair-Brown era. He will admit that New Labour was wrong to allow "light-touch" regulation of the City of London and to let people build up huge levels of debt. So whilst people built up this debt you objected how exactly? I don't recall Ed making too many statements about the build up of debt threatening economic stability. In fact, I think its about time, a list of the reasons why Labour are to blame, were repeatedly sent around Student unions, posted through letterboxes, etc. You think you can say a couple of sentences at a conference, yes, and sweep it under the carpet? The anger at the Labour party will burn for decades. Labour have made it very clear that they are the enemy. You have no credibility. F*** off and die. As each new generation finds out they are working for nothing. No capital. Unable to get onto the ladder. They will know who is to blame. Mew labour says "lets just abolish bust this time!!!". Wouldn;t be difficutl would it? The reason why you are paying so much for student digs is thanks to Labour's bubble, the reason you have increasing tuition fees is that the country is running a permanent trade and government deficit thanks to appalling economic management and cannot afford to invest in its future and its chldre, the resaon you need a degree at all for some crappy call centre jobs is because labour loved to provide jobs for anybody but the indigenous population, you will have falling salaries in real terms, little or no pension provision and are likely to have to work till you die paying off the pensions of millions employed by labour to do inreasingly non-jobs in vastly overpaid public sector placements and the bill from the gambling habis of the bank shysters that were given everything they wanted and more at YOUR expense. Pity Dedward* didn't say something when the sub-Fuerhrer was busy wrecking the economy with the miracle of never ending house prices. The problem is most people don't think that Labour are to blame. They'll win the next election by a landslide after the Tories get spending under control, and start buggering things up again. Merv must be living in fear of deflation. IMO the only sane way out of the mess is to allow the economy to do what it would normally do as a massive bubble deflates. Mervs plan to get people to borrowe more to deflate the bubble is a sign he needs to retire while his reputation is still sort of intact. The sheeple in the US are already blaming Obama for the mess. Poisoned chalice scenario. People are really stupid IMO. If that were to happen over here, it would really really pi55 me off. As such, I think it would be worth sending out lists of reasons why Labour are to blame, en masse, to student unions etc. Cause you certainly can't get a straight story from the press. 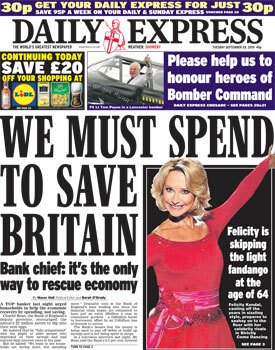 Do you mean Merv's plan is for people to spend their savings or spend their borrowings? Yes Ed, Gordon was wrong. We all already know that. What are you going to promise instead? Ah but only enlightened folk such as you know the difference. If Americans are so f'en stupid why are they the only nation in the Western world who have a political party rising from this current mess with policies aimed at ending huge unaffordable govt., and dealing with banksters. Im thinking its the British who are f'en stupid and like good brainwashed Turkeys will keep on voting for Xmas. It's not audacious at all it's just being forced into accepting the reality - and after the event - when it's been proved beyond a shadow of a doubt. And especially in an economy run by the likes of the Bankrupt of England the busts will be even bigger than normal. It would have been audacious if he'd come out and said it when in power but saying it now is just opportunist. His reputation was shot to pieces by those who understand a few years ago , the masses do not understand and many would not even know who this k**t is , he should resign , crawl into the undergrowth and die , but he won't , he'll just keep spouting the usual shyte , lies and will forever be behind the curve . Too busy waterboarding and "selling" global warming. It's not their fault. what did Merv do wrong? He had no power to stop the credit boom, that was taken away from him by golden Gordon early on into New Labour. Before, the Bank of England would have warned banks about their lending, and told them to desist. This was the FSA's beat, and they were clueless. Not Merv, he knew what was going to happen, and warned about it, which was about as much as he could do. Then they embarked on QE to try and sort the mess out. This has clearly helped things, our problems are not nearly as great as the USA and other countries, despite the fact that proportionally our boom was bigger than theirs. They still have the uneviable task of letting the credit boom deflate, that isnt going to be easy, but so far we still have a functioning economy. So which of Mervyn King's policy decisions do you disagree with? +1. There was mention of an opinion poll on Newsnight last night which had Labour in front. WTF!! "Think of how stupid the average person is, then realise that half the people are dumber than that". Last year I worked at an oil refinery with fairly well educated males say 55+ who were talking about how Blair was a great Prime Minister ... ive never heard such talk from acquaintances my age (30s), it was unbelievable to hear people utter such words i was stunned .... could it be we're going to get a Lib-Lab coalition because the young are too blase to vote and the older generation are working class Labour voters unitl the day the die. The Liberals and the left wing of the Labour party are perfect bedfellows, could it actually be a masterstroke by the Unions aimed at a future coalition. I'm as happy as the next one to indulge in a bit of new-labour bashing (and the millibands can twit off), but the notion that they were a socialist government is utter twaddle. I'd happily vote for some decent democratic socialists - a party that placed sound economics first, and support for UK manufacturing second (which is the best way to support the working class imho), and support for the underclass through the welfare state third. Labour are only Social Democrats from the tainted personal perspective of a certain demographic. A more accurate description of Labour, for the millions priced out of housing, would be, [Economic] Fascists. [The Labour Party are directly responsible for inflating the biggest asset bubble in History. The Housing Market. Labour then transferred that debt onto everyone else in society. So our money is being stolen, through QE, Low IR, increased taxes, mortgate relief, etc, to pay for this toxic mortgage debt, to bail out the banks. In effect, our money is being de-valued and stolen to pay for other peoples houses. Obviously not a 'socialist' or 'democratic' act. The most notable characteristic of a FASCIST ideology is the separation and persecution or denial of equality to a specific segment of the population. The preferred class lives in relative comfort, while the oppressed class lives in a Fascist state. Labour are [justifiably] hated like no other government whom has held power amongst certain segments of society.